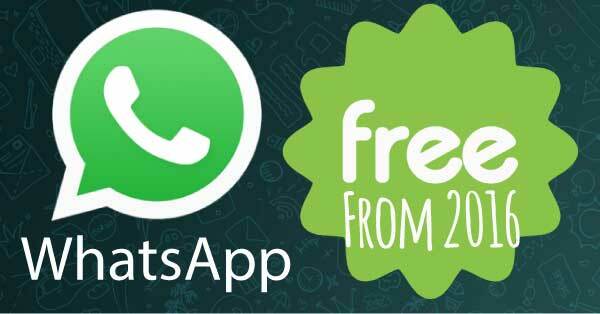 The instant messaging application, WhatsApp, becomes free to use for all users. From 2016, the Facebook-owned service is dropping its subscription fees from the different versions. There was an official announcement from the founder Jan Koum. WhatsApp will no longer charge subscription fees of 69p-a-year. Through a post on the official blog, along with the statements of the founder, Jan Koum, the company announced that the annual subscription fees will cease immediately (although, in reality, there is a cost, as you will discover in this article). It’s a return to the past, since – as many remember – the app was born at no cost, then it was introduced later. The WhatsApp founder, Jan Koum, spread the news on Monday, explaining that the decision was taken to remove the barrier for millions more to access the service. So far, WhatsApp was only free for the first year, before moving to a cost of 69p-a-year (with few exceptions). Apparently, a small amount, but multiplied by the hundreds of millions of users around the world, guaranteed WhatsApp a good profit. Only first users were granted a free lifetime service. About the new business model (somehow, it must continue to earn), WhatsApp explained it is going to explore new ways in which companies can use the service to connect with people, but pointed out it won’t be adverts and won’t enable third-party ads within the service. It’s sticking to its original principles and will avoid spam and unwanted advertising. If your subscription is about to expire in the next few days, and WhatsApp is asking you to renew the annual subscription, don’t panic. It will take a while before the payment service of WhatsApp is disabled for all users. Therefore, wait for the automatic app reactivation or pay for the subscription, and WhatsApp will return the amount you spent as soon as the deactivation of the payment reaches your mobile phone. Don’t forget to update the app to the latest version. The announcement that WhatsApp becomes free forever and for everyone cheered users, who don’t look favourably upon subscription fees, whereas similar services were free of charge. However, WhatsApp consumes a data plan (especially the calls), and not many realize it. Of course, it’s a small amount per month, and perhaps, it’s worth it. The question is: How would we do without WhatsApp?